Reports that production at the southwestern El-Fil oilfield has been reopened have been denied by the National Oil Corporation (NOC). “The NOC would like to explain that the field is still under force majeure because technically it cannot be operated without electrical power coming from the Sharara field,” the NOC’s media office told the Libya Herald. “As far as it is concerned, the Sharara field is still shut because of the closure of Reyayna pipeline,” a spokesman explained. On Wednesday, the Presidency Council’s defence minister, Mahdi Barghathi, visited El-Fil field. 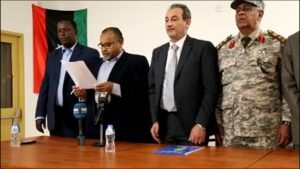 In a joint statement with Idris Boukhamada, head of the PC’s Petroleum Facilities Guard, at an event in Murzuk at which the field was declared open again, they said the move would improve the situation for local people. In its denial of the reopening, the NOC again called for the immediate and unconditional opening of all fields and and pipeline valves, pointing out that for the economy to revive there had to be a major increase in oil production. Having reopened in December after a two-year closure, the valves on the pipeline from El-Fil were again turned off three weeks ago by gunmen who complained that they were not seeing any economic benefits from the country’s oil wealth. However, there are claims that the real reason was related to smuggling issues. The field is operated by Italy’s Eni. Prior to last month’s closure, it and the nearby Sharara field, operated by Akakus, a NOC joint venture with Spain’s Repsol, were producing some 250,000 b/d.